When you say Argentina, you say meat. Lots of meat. And in Formosa you get that. Rib-eye steak and much more. Tender meat for a tender price, value for money. 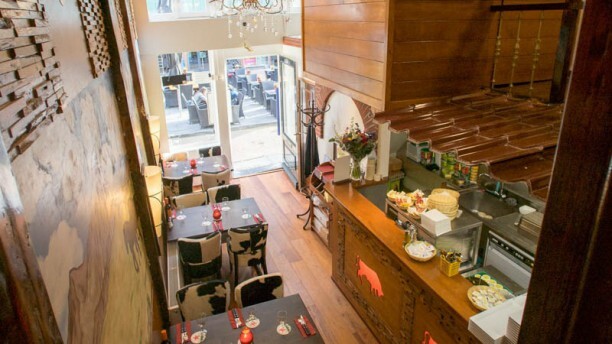 A fine Argentinian restaurant in the heart of Amsterdam. Also a restaurant with a cozy atmosphere and friendly staff. A place where you can spend a great evening with friends or family. Good restaurant, kind service and tasty food. The meat was well cooked. Very nice meat, very friendly and beautiful staff. Staff were very friendly and the food was excellent. Dinner for 6 and all really enjoyed their food. Meat was excellent and reasonably priced. Good choice. Very welcoming service and they know how to treat meat exactly the right way. Vegetables could have been served with more attention to detail in my opinion but I think an Argentinian restaurant is about the meat and that was delicious and prepared to perfection. The staff was very pleasant and authentic. We will return on our next visit to Amsterdam! We had made a „last minute booking“ with The Fork using a discount and when we arrived the restaurant was nearly empty. Although I said that I had reserved a table they didn‘t check that and let us just sit anywhere. As I wanted to be sure to receive the discount I repeated that I had made a reservation with The Fork and then they checked and confirmed the discount. The service was really good and the food (for the reduced price) was also satisfying. Only the interior of the location is sort of „unspectacular“. We had an amazing time here at Formosa. The people were all really friendly and helpful, the food was great quality and reasonably priced. So glad we found this little gem. They made it a very memorable special evening as it was an important celebration. They exceeded our expectations and we couldn't have asked for any more. Satisfying meal and fantastic service! Mixed grilll for two was outstanding. Superb selection of meats, cooked just right. Be aware that sauce costs extra. Amazing meat, decent wines, great service. Overall very good experience, don't be fooled by the neon lights and step in it's worth it. Very good little restaurant in the center of Amsterdam. Does not look much from the outside but food and service were both excellent. House wine was very good too. The red was available on arrival on each table which is a great simple idea to view before ordering. Good food and service - decent value for money. The waiter was attentive but not too intrusive.